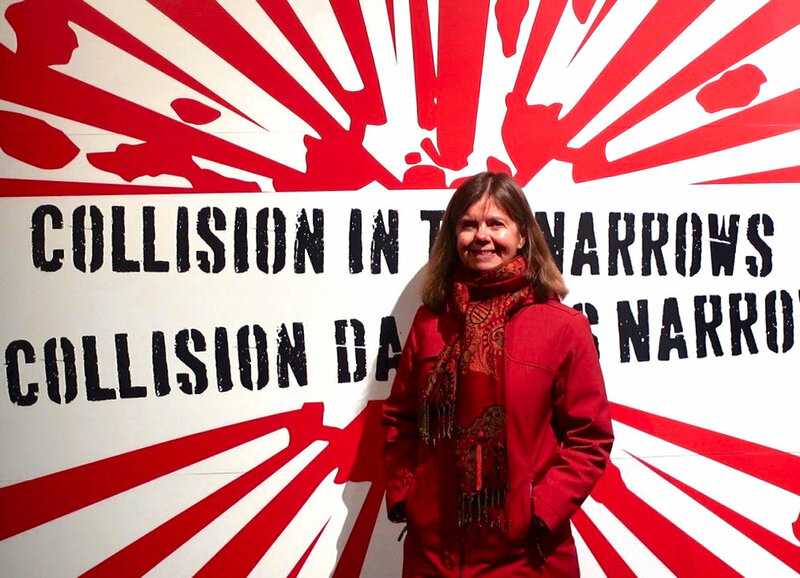 Author Julie Lawson standing in front of a sign commemorating the Halifax Explosion during her recent trip to Halifax. Photo by Partick Lawson. James Bay resident and well known author Julie Lawson recently returned from Halifax where she took part in the commemoration of the 100th anniversary of the Halifax Explosion. Her recently published book, A Blinding Light, tells the story of the explosion through the eyes of two fictional youth, Livy, aged 12, and Will, who is aged 15. While A Blinding Light is intended primarily for youth, I thoroughly enjoyed reading it as a senior. Exploring a tragedy through the eyes of 12 and 15 year olds provides unique insights. Universal themes are explored in the book, such as the negative impacts of discrimination, the importance of being positive, and treating others with respect. While the book is about the events and aftermath of the explosion, it also delves into discrimination, bias and rushing to judgement. The fictional children’s father, who was apparently mysteriously lost at sea months prior to the events of the story, was of German descent, and the book provides an accurate view of the anti-German sentiment common in Canada during wartime. 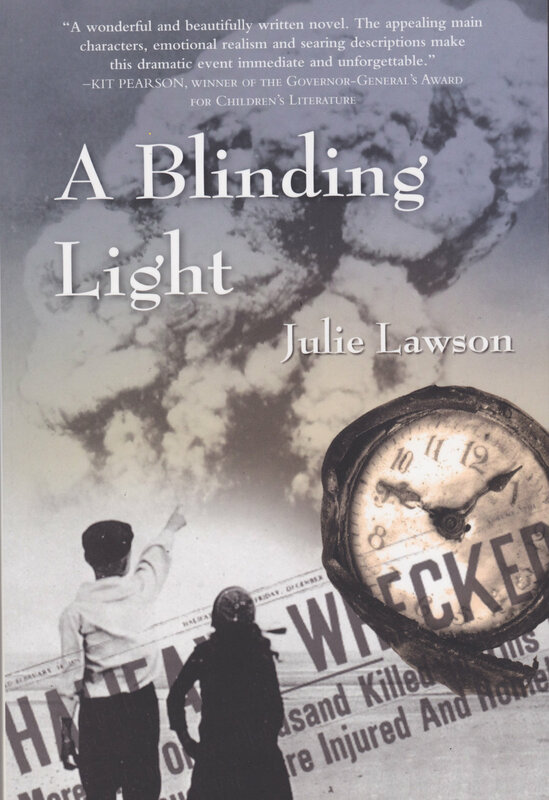 In A Blinding Light, Will, who is 15, directly observed the explosion, and was called to testify at the commission formed to assign blame for the collision. Emotions ran high, and scapegoats were sought to simplify blame for the tragedy. Although the work is fiction, a remarkable amount of precise historical information is presented in the book. Detailed author notes at the end of the book amplify what is learned through the story itself. While A Blinding Light is her most recently published book, Julie has written about 40 different books, mainly intended for children, youth, and young adults. As a child growing up in Victoria she dreamed of writing a book and having it in the library. Now her many books are found in libraries from coast to coast to coast in Canada and beyond. Cover of A Blinding Light courtesy of Nimbus Publishing. The book is by James Bay resident Julie Lawson, with the cover design by Sari Naworynski. Both professional reviewers and readers have praised her books. For example, from Atlantic Books about A Blinding Light: “Lawson's nuanced telling keeps us on edge, hoping moment by moment that her characters will survive against the odds.” Her books have won multiple awards. No Safe Harbour was winner of the 2008 Hackmatack Children's Choice Award. Julie Lawson’s books are well represented in local libraries. My author search of the Greater Victoria Public Library database revealed 40 holdings of her works, including both print and electronic versions. Many of her books are also at the James Bay Community School library and enjoyed by children at the school. The copy of No Safe Harbour I consulted for this article was from that library, and included an inscription as a donation to the school library from the author. Julie Lawson has chosen Victoria as the setting for many of her historical fiction works. For example, she tells the story of Emily, born in 1896 in Victoria, as part of the Canadian Girl series. Here is a little taste from the back cover of Book Two in that series (titled Disaster at the Bridge): “On May 26, as Emily and her family and friends board streetcars for the ride to Esquimalt and the climax of the holiday celebrations, all petty squabbles are about to be forgotten. As their streetcar rolls onto Point Ellice Bridge, disaster strikes. It will take all Emily’s strength to save herself and those around her.” Even closer to home, this book was a sequel to her earlier book Across the James Bay Bridge in the same series. The wonderful picture book In Like A Lion by author Julie Lawson and illustrator Yolaine Lefebvre tells the story of a cougar visit to James Bay on March 3, 1992. After a 5:15 am sighting, as the cougar walked out of Beacon Hill park near Beacon Drive-In Restaurant, hours of search in James Bay did not locate the cougar. That is, until 11 pm that night, when the cougar was seen entering the underground parkade of the Empress Hotel! The story is told from the perspective of a child whose father is the conservation officer who tranquilized and relocated the cougar. When we read the picture book to our grandchildren they loved both the story and the illustrations of places they knew well like Beacon Hill Park, the Royal British Columbia Museum, Thunderbird Park and the Empress Hotel grounds. On her author website, Julie expresses her goals as a writer this way: “My hope is that kids get the same pleasure from reading that I had when I was their age. I want them to feel for the characters, travel in time to experience history, get caught up in adventures and go sailing off on flights of their own imagination.” I can confirm that it is not just kids who feel for the characters and travel in time to experience history through her books. You can pick up a selection of her books at local bookstores, or order them online. The details for her newest work are A Blinding Light (Nimbus Publishing, 2017 ISBN 978-1-77108-541-0). The author has an excellent website http://julielawson.ca/ that can serve as your guide to her books, along with delightful personal autobiographical glimpses. On the website are links to an interview she did with the local CTV affiliate while in Halifax, along with other interviews.